This Pancho picture was taken in Maldonado Uruguay. I wish the picture turned out a little clearer but on the bright side, it gives me a reason to buy another Pancho in order to take another picture. 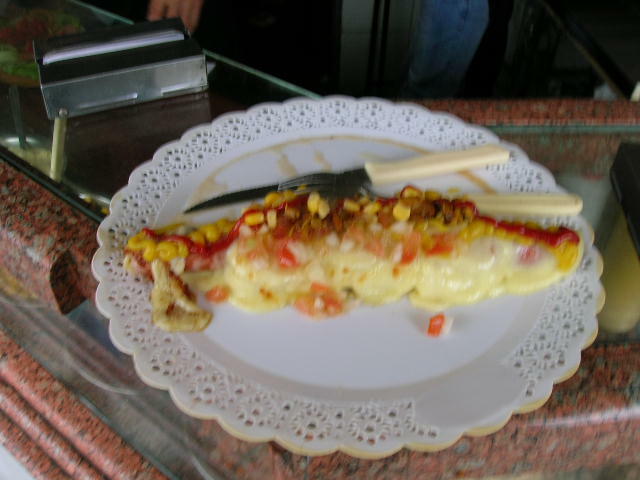 You can see that the hotdog is covered with various toppings that you would never see on a North American hotdog. The hotdog toppings that I thought were different were corn and melted mozarella cheese. This hotdog is longer than a typical Canadian hotdog. I dont think I have ever eaten so much cheese in one sitting. I found it ironic that Canadians are called cheeseheads, since our cheese consumption doesnt come close to what you can expect to experience in Uruguay. You can buy them on the streets of any cities of Uruguay. Here are a couple links for you to be able to see some large pictures of both a typical Hotdog stand in Uruguay as well as a concession stand in Uruguay. If you are interested in making a submission, We Welcome you to Click here to make a submission or continue to Explore Uruguay with me.